Can Apple’s color-shifting screen really help you fall asleep faster? Last week, Apple released iOS 9.3 and introduced "Night Shift" — a way of modifying the computer’s display so that less blue light is present — to millions of iPhones and iPads. 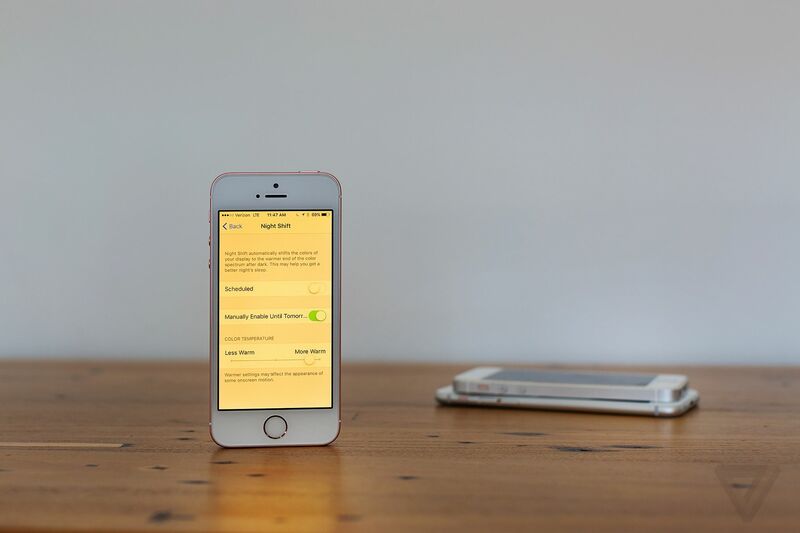 The feature, if enabled, will automatically take effect when the sun goes down, making the phone look "warmer" as the screen displays more of the yellow-orange end of the spectrum. In its description of Night Shift, Apple insinuates that it is designed to help you fall asleep easier, if you happen to be up late using your smartphone or tablet. It’s similar in practice to f.lux and other apps available for desktop computers that have been out for years, though being baked into iOS opens up this kind of feature to a much larger audience. There is some science behind light affecting our natural rest patterns. Blue light helps set our body clocks — circadian rhythms, if you’re feeling fancy. The natural human body clock is actually 24.2 hours, rather than 24 hours — which is why it’s easy to stay up too late, says Raj Dasgupta, a sleep medicine specialist at the University of Southern California. But we respond very strongly to sunlight, which in the days before electricity was the main cue for sleeping and waking. Our bodies have a particularly strong response to blue light, which suppresses a hormone called melatonin that prepares our bodies for sleep, Dasgupta says. "Any light source is going to have the effect of suppressing melatonin," Dasgupta says. "But the most potent one is blue light." People with certain sleep disorders use light therapy to help reset people’s internal clocks, he says. If someone is having a hard time getting to sleep at night, being exposed to blue light during the day and darkness at night can help. Blue light isn’t the whole story for sleep disorders, though — since anything that’s too stimulating can also keep you awake, Dasgupta says. That includes relatively low-tech interactions like arguing with a loved one over dinner. Which means that if you’ve turned on Night Shift but are receiving alerts from your boss, or are watching something disturbing, you’ll probably still have trouble getting to sleep. Sleep isn’t the only thing blue light affects, either. It’s also a source of eye strain, says Andy Morgenstern, the chair of the American Optometric Association’s new technology committee. It doesn’t necessarily harm the eyes like UV light — which can cause cataracts — but it’s not a high-quality light to see by, he says. Though Night Shift’s main focus — judging by the name — is to offset the iPhone’s effects on the circadian rhythm, limiting blue light on devices may lead to fewer headaches, blurry vision and dry eyes, Morgenstern says. That’s why your eyes may feel more relaxed and less strained when you’re looking at a device with Night Shift on after the sun has gone down. Still, there’s a lot about blue light that isn’t known, says Geoffrey Goodfellow, an associate professor at the Illinois College of Optometry. What’s more, we don’t really know what wavelengths of light are being emitted by our devices. "When you buy a device, you get a clear, bright screen," Goodfellow says. "Blue light isn’t regulated." While Night Shift may alleviate some eye strain, it doesn’t make clear what wavelengths are being cut. Nor is it clear what the optimal level of blue light for reducing side effects like eye strain and sleeplessness are. And since the filter is adjustable, it’s not clear that users who use Night Shift at low levels get any benefit at all. "Imagine adjusting your medicine to compensate for flavor," Morgenstern says. He’d like to know the minimum setting for effective Night Shift use — as he has set his own to start at sunset and end at sunrise — and how the settings were picked. Apple didn't have details to give me on Night Shift's specs — for instance, how high the filter had to be set to be useful, and what wavelengths it would filter out. Blue light isn’t the whole story in eye strain, either. Both Goodfellow and Morgenstern warn that a major component of eye strain is looking too long at objects that are too close. Not just screens, either — reading dead-tree books up close has long been linked to nearsightedness. Our default focus for our eyes is about 20 feet in front of us, Goodfellow says. "They weren’t meant to stare at something a foot and a half away for hours and hours and hours," he says. Rates of nearsightedness have gone "through the roof" in the last two decades, Morgenstern says. That’s because we’re looking at things up close all the time. "The joke is that your mom wasn’t so wrong about sitting too close to the television," Morgenstern says. At any rate all three experts agree: removing blue light — assuming the Apple filter is effective — won’t necessarily make you sleep better or prevent the side-effects of eyestrain, like headaches. (None of the experts I called mentioned any harmful side-effects from Night Shift; at worst, it’s probably just ineffective.) The best way to fall asleep easily is the same as it ever was: don’t use your electronic devices late into the evening. Night Shift may help, but it’s not the magic solution for sweet dreams.